The Nolans singer lost her 10-month battle with breast cancer after the disease tragically spread to her liver, bones, brain and lungs. She leaves behind her husband Steve Doneathy and her 14-year-old daughter Erin. Bernie was being looked after in a hospice, but returned home shortly before her passing to spend some quality time with her family. A spokesman for the family said: "Bernie passed away peacefully this morning with all of her family around her. "The entire family are devastated to have lost beloved Bernie, a wonderful wife, adoring mother and loving sister; she is irreplaceable. "They kindly ask people to respect their privacy at this difficult time." The singer was diagnosed with cancer for the second time last year after previously beating the illness following chemotherapy and a mastectomy, receiving an all-clear in 2012. She was best known as the lead singer of Anglo-Irish girl group The Nolans alongside her sisters, storming the charts with pop tunes like 'I'm in the Mood for Dancing'. She later appeared in ITV series 'The Bill' and Channel 4's soap 'Brookside'. Former co-stars and fans were quick to take to Twitter following the sad news express their condolences to her family. Bernie's 'Brookside' co-star Jennifer Ellison tweeted: "So sad to hear Bernie Nolan has passed away. Such an amazing lady, had the honor of working with her twice will cherish the memories." 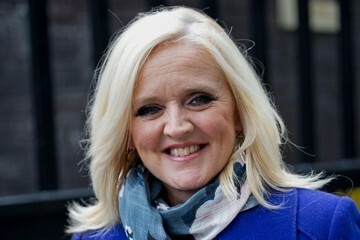 This Morning' presenter Phillip Schofield posted: "Just heard the very sad news that gorgeous, courageous and inspirational Bernie Nolan has died. Big love to @NolanColeen & all the family x"